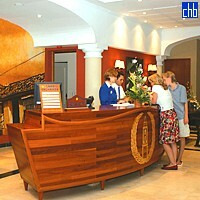 The Grand Trinidad Hotel could well be Cuba's finest provincial hotel. 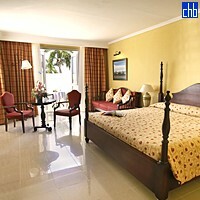 Offering a much-needed deluxe option for visitors to this most popular of Cuban colonial cities. 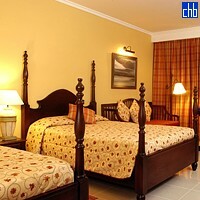 The hotel is located in the centre of Trinidad, a jewel of colonial architecture founded in the 16th century and declared World Heritage by UNESCO in 1988. 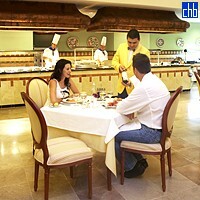 The Iberostar opened in 2006 and has justifiably earned plaudits as a true five-star hotel. 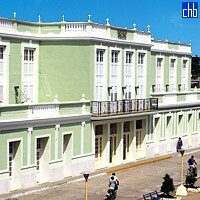 The hotel is a conversion of an unassuming, two-story, mint-green 19th-century mansion on the north side of Parque Céspedes. Beyond the front doors, however, and... wow! 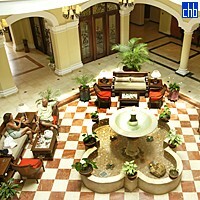 The lobby, supported by columns, gleams with marble, travertine, and polished hardwoods. Halogens inset in the ceiling bespeak a contemporary styling reflected in the sumptuous furnishings of the atrium lobby lounge graced by wrought-iron railings and a Moorish-style fountain. Guest rooms recreate the gracious ambiance of yesteryear with their mahogany colonial reproduction furnishings, including four-poster beds and gold, red, and cream color schemes. And the quality mattresses here guarantee a good night's sleep. Bathrooms are clad in gray local marble and have bidets, large walk-in showers and separate marble-topped tubs, marble countertops, and embossed fluffy towels. Even if you don't stay here, the ritzy restaurant is worth a splurge. 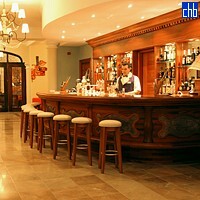 The half-moon bar with high stools would do New York proud. 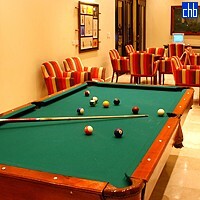 There's a games room with large pool table, and the wood-paneled cigar lounge-bar has tempting deep-cushioned seating from which it is hard to escape. And the fancy jewelry store speaks to the kind of clientele who can afford the hotel's stiff pricing. No children are allowed to sully the calm of this genteel place. If you're going to splurge at one place in Cuba, let it be here. Grand Trinidad 36 standard rooms. Adults only (15 and over). 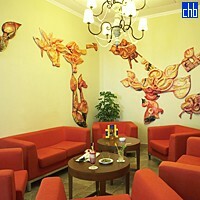 Grand Trinidad has 4 junior suites and are for adults only (15 and over).